Our apartment offers air-conditioning during the warm season as well as central heating if you get a bit chilly with ceiling fans in all bedrooms. This secure gated and patrolled site offers you peace of mind for all the family. The 18 hole Hacienda Riquelme Golf Course, designed by Jack Nicklaus Design is a par 72 and 6416m course built to professional standards. The course covers an area of 71 hectares and has a stunning mountain backdrop and panoramic views of the coast. This course is one of a group of six golf courses that make up some of the best in Europe. It is different from the others, providing ample fairways combined with hard to approach greens, and bunkers ready to challenge your game. we are Steve, Bianca and Paul. We own the apartment between us which works extremely well. The three of us come from Cambridge and have been friends for many years. We have always looked to buy somewhere in Spain and found this lovely opportunity and we have never been happier. We share the appartment between us and are very happy to rent it out for the weeks that we are not there so that others can enjoy it too. We feel it is home from home and has so much to offer. We fell in love with the whole idea of idealic spacious settings, pool access and golf literally on our door step. what more could you ask for. The people are so friendly and food is so good. Everytime we come to spain we find so many more places to explore and enjoy. It's fantastic. You will enjoy exploring and seeing so many new things while you are here as well as knowing you can have all your creature comforts and just kick back and relax. The area is so tranquil and relaxing with wonderful views over the fairway. Bath with shower, luxury basin, bidet, heated towel rail, Large oak framed mirror and WC. Light and spacious lounge with sliding doors to terrace with two leather sofas 1 dining-table, witch can be extended and 6 chairs. Flat screen Sony HD 27’ TV, DVD player, The TV has most Europe and UK channels. Very well equipped kitchen with Hob, oven, ventilator, fridge/freezer, dishwasher and microwave. Toaster, electric juicer, coffee-maker, utensils, pots, pans etc. Extra cupboards and drawers. The 18 hole Hacienda Riquelme Golf Course, designed by Jack Nicklaus Design is a par 72 and 6416m course built to professional standards. The course covers an area of 71 hectares and has a stunning mountain backdrop and panoramic views of the coast. This course is one of a group of six golf courses that make up some of the best in Europe. It is different from the others, providing ample fairways combined with hard to approach greens, and bunkers ready to challenge your game. The course is surrounded by wild flowers, olive trees and stunning lakes. Other golfing amenities include a driving range, golf academy and pro-golf shop on the resort, however, whilst staying at Hacienda Riquelme you are able to use the amenities and play at reduced rates at La Torre Golf Course, El Valle Golf Course or Mar Menor Golf Course. A courtesy coach is provided to transport golfers and holidaymakers to and from these resorts. Notes on accommodation: Our apartment has ceiling fans and air-conditioning during the warm season as well as central heating if you get a bit chilly. This secure gated and patrolled site offers you peace of mind for all the family. An optional baby kit, including cot and mattress, potty, highchair, step stool and bath is bookable subject to availability (baby's own bedding to be supplied). Outside: The spacious terrace leads directly from the lounge/diner. There is outdoor dining furniture and 3 sun loungers. The terrace has beautiful views over the pool and golf course with fantastic sunsets. Cleaning / Towels / Linen / Maid service: Bath towels, towels and all bed linen are provided including beach towels. The apartment is cleaned and prepared just before your arrival. There is a charge of 55 Euros for cleaning and laundry, to be paid locally. Other: We have two bicyles which you are welcome to use to get around the resort or surrouding areas. We had a lovely time as a family of 5 in this apartment for our 2 week summer holiday. The apartment is very well-equipped, clean and comfortable. The location next to the pool was ideal for the kids and an easy walk to the shop and clubhouse. The pool was a highlight for the kids - big and warm, with lots of other children to play with. The apartment is East facing so just a little disappointing to lose the sun on the patio by mid afternoon, but this was not the end of the world. Thank you Bianca for a great holiday. 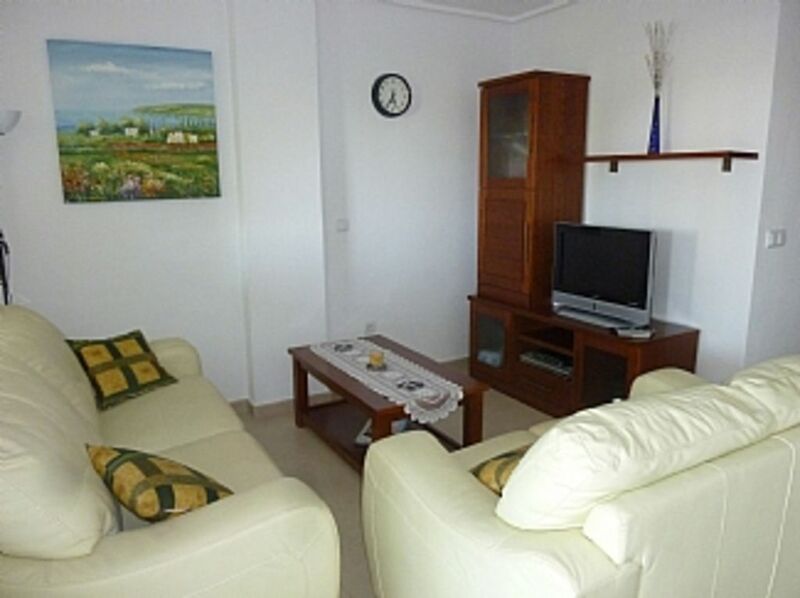 Great apartment with everything you need for a great relaxing holiday. The pool is a few steps away from the covered terrace where you can enjoy the warm weather well into the evening. The apartment is conveniently located a short walk from the on-site supermarket and restaurant. The resort is clean with 24 hour security. The village of Sucina is less than a 5 minute drive away and the wonderful beaches are a 15 min drive. Great location and easy to book with owner. We booked very last minute and took over apartment from friends who were already there. Bianca was excellent and answered our last minute messages quickly and efficiently. However, we were not contacted by the key holder as had been requested, and in the end had to contact them ourselves by email which went unanswered, so we had to call him - was a shame really, because Bianca had been fantastic. Todo perfecto y muy limpio, mucha tranquilidad para descansar. There's lots of choices of what to do in the Costa Calida - and even a choice of which Sea to go to! You can choose between the Mediterranean Sea, and the lesser known Mar Menor (little sea). The Mediterranean beaches include some fabulous white sand walks that the locals favour, while the Mar Menor is an inland sea/salt water lake separated from the Mediterranean by La Manga del Mar Menor; otherwise known as the La Manga strip. Murcia airport is the nearest airport which is only 15 minutes away with Alicante airway just as easily accessible and only 45 minutes away. you can car hire at both airports and this is advisable. Hacienda Riquelme offers a number of on-site facilities which include several impressive swimming pools and children's fenced play areas, outdoor gym, the hugely famous Nicklaus design golf course, tapas bar and mini-supermarket. You also have access, by way of courtesy shuttle buses, to the full facilities, including restaurants and shops, on nearby Polaris resorts. The area of Murcia sits on the south east corner of Spain, with Costa Blanca to the North and Costa Almeria to the South. Booking Notes: A deposit of £100 is required to secure a booking, with the balance being paid 8 weeks before departure (or at owners discretion). A fee of 60 euros is payable locally (left in the apartment) to pay for cleaning and laundry on vacating the apartment. A welcome pack can be provided at extra cost, details of which can be provided when booking as well as a meet and greet to show you how everthing works in the appartment for 15 euros again paid locally. Changeover Day: There is a charge for cleaning on changeover day of 60 euros (for 4 people) paid locally. if more than 4 occupy the appartment an exta minimal charge will apply. Notes on prices: Changeover day can be flexible. We can arrange short lets (minimum of 3 nights stay) and discuss discounts for longer lets please contact owner. meet and greet, welcome packs and much more can be arranged for an additional small extra cost.